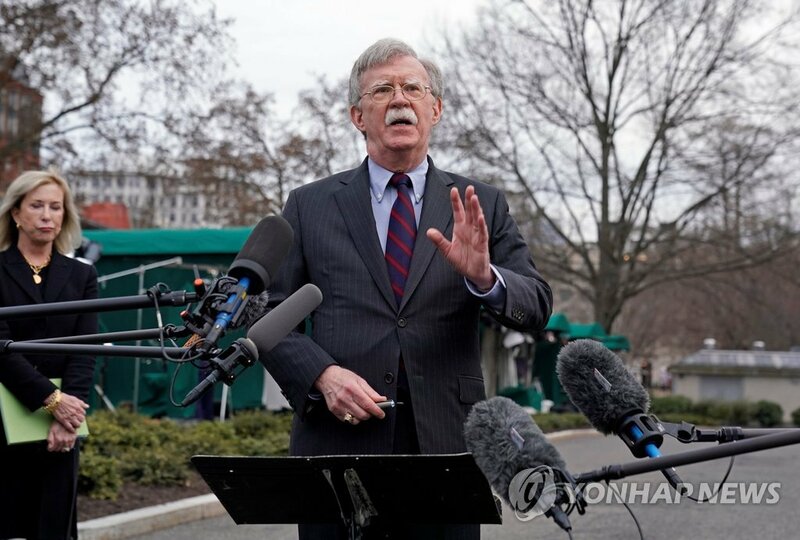 WASHINGTON, March 21 (Yonhap) -- U.S. President Donald Trump gave North Korean leader Kim Jong-un "several alternatives" when they met last month to try to strike a deal on denuclearizing the regime, U.S. National Security Adviser John Bolton said Thursday. On what the alternatives were, Bolton didn't elaborate, except to describe again the "big deal" he has said the president put on the table in Hanoi, Vietnam, on Feb. 27 and 28. "President Trump gave him several alternatives, what he called the big deal: North Korea gives up all of its weapons of mass destruction and ballistic missiles, and in exchange, there's a very bright economic future for North Korea," he said in a radio interview with the conservative Breitbart News. The summit ended without any deal due to disagreements over the scope of North Korea's denuclearization and sanctions relief from the U.S.
Bolton refused to characterize the meeting as a failure, saying the president defended American interest in the face of an unsatisfactory offer from the North. "In many respects -- in Hanoi and even before that, in Singapore -- what the president did was hold the door open for North Korea, to say, 'You can have this future but you've got to give up your weapons of mass destruction,'" he said. "So far, the North Koreans haven't walked through it." Asked to explain what victory would look like for the U.S., Bolton reaffirmed that the main objective is a denuclearized North Korea. "And we gave them a definition. The president actually handed over a piece of paper, two pieces really, one in English and one in Korean to Kim Jong-un that describes our definition of denuclearization," he said. "0nce that happens, the president, you know, he sees these things sort of in real estate terms. He says, 'Look at North Korea's position there between China, Russia, South Korea. It's a great location. It could have a great economy.'" Bolton noted the importance of China as North Korea's dominant trading partner and the need for Beijing to tighten enforcement of sanctions on Pyongyang. "China's always said, going back over 20 years now, they don't want to see North Korea with nuclear weapons," he said. "And I think they have good reason not to want to see North Korea with nuclear weapons because China ultimately doesn't want to see Japan get nuclear weapons. "So China could really hold the key to this here if they press North Korea hard enough," he added.